Darjeeling: Inspired by the legendary Russian artist and philosopher Nicholas Konstantinovich Roerich, the Darjeeling Goodwill Centre (DGC) celebrated a decade of his love and labour of cultural contribution, inspiration and creativity by observing the 'Xth Goodwill Week' from November 10 to November 15th. Nicholas (1874-1947) was an internationally acclaimed Russian artist (responsible for over 7,000 paintings), a philosopher, an author, a daring explorer, a conservationist, an archeologist, a scientist, a humanitarian and a peacemaker. Nicholas Roerich along with his wife and son George had arrived in Darjeeling in 1923. In Darjeeling, Nicholas created many of his masterpieces. During their stay in this region, (Darjeeling and Sikkim) the Roerich planned their famous Central Asiatic expedition. On March 5, 1925, the Roerichs left Darjeeling for the expedition and the caravan finally returned back to Darjeeling in May 1928 after completing the expedition. The DGC was established in November 2008 by the Himalayan Institute of Goodwill and Living Ethics (HIGLE) in cooperation with the Darjeeling Goodwill Animal Shelter (DGAS) Trust. As a part of the World Goodwill network, DGC aims at building a new culture by fostering goodwill, understanding and compassion. "The DGC is inspired by the great Russian painter Nicholas Roerich and his endeavour towards a culture of peace, represented symbolically in the Banner of Peace, invoking within the circle of culture a vibrant cooperation between arts, science and religion. This had given birth to the Roerich Pact," stated Fiorenza Bortolotti, an architect from Italy, who is the Project Manager at the DGC. The pact provides for protection of cultural memorials of all humanity and was signed in 1935 in Washington by 21 countries presided by US President F Roosevelt. India had approved of the treaty in 1948. Along with the review of 10 years of work on "Seeds of the Future: Education" with its 2018 subtheme: "Roots and Fruits", the main attraction of the Goodwill Week was the international première of the Goodwill Song, composed and conducted by Virgil Vihaan Sequeira and performed by the Goodwill Choir and the Strings 2019 orchestra including the folk musicians of the Hills. The important highlights of the Week included an exhibition consisting works of Nicholas and Svetoslav Roerich — "Painters of Kanchenjunga". Another exhibition "Visions of Darjeeling — Darjeeling yesterday-today-tomorrow?" of architect Shasheesh Prasad urged people to take responsibility for a better, more beautiful and sustainable tomorrow. In the fields of art, education and sustainability interactive meetings and discussions were held. A special contribution regarding the participation of Darjeeling community in the Global Action Plan of UNESCO in the Sustainable Development Goals, Water and Sustainability was also discussed. Art classes, competitions along with story telling with art students were an important component. Darjeeling: Inspired by the legendary Russian artist and philosopher Nicholas Konstantinovich Roerich, the Darjeeling Goodwill Centre (DGC) celebrated a decade of his love and labour of cultural contribution, inspiration and creativity by observing the 'Xth Goodwill Week' from November 10 to November 15th. Nicholas (1874-1947) was an internationally acclaimed Russian artist (responsible for over 7,000 paintings), a philosopher, an author, a daring explorer, a conservationist, an archeologist, a scientist, a humanitarian and a peacemaker. Read This - Baruipur Correctional Home to have all facilities for inmates, top-notch security Nicholas Roerich along with his wife and son George had arrived in Darjeeling in 1923. In Darjeeling, Nicholas created many of his masterpieces. During their stay in this region, (Darjeeling and Sikkim) the Roerich planned their famous Central Asiatic expedition. On March 5, 1925, the Roerichs left Darjeeling for the expedition and the caravan finally returned back to Darjeeling in May 1928 after completing the expedition. Read This - Some security issues need to be ironed out before Kolkata Gate opens for public: Hakim The DGC was established in November 2008 by the Himalayan Institute of Goodwill and Living Ethics (HIGLE) in cooperation with the Darjeeling Goodwill Animal Shelter (DGAS) Trust. As a part of the World Goodwill network, DGC aims at building a new culture by fostering goodwill, understanding and compassion. "The DGC is inspired by the great Russian painter Nicholas Roerich and his endeavour towards a culture of peace, represented symbolically in the Banner of Peace, invoking within the circle of culture a vibrant cooperation between arts, science and religion. This had given birth to the Roerich Pact," stated Fiorenza Bortolotti, an architect from Italy, who is the Project Manager at the DGC. The pact provides for protection of cultural memorials of all humanity and was signed in 1935 in Washington by 21 countries presided by US President F Roosevelt. India had approved of the treaty in 1948. 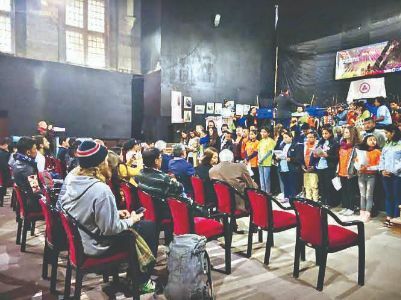 Along with the review of 10 years of work on "Seeds of the Future: Education" with its 2018 subtheme: "Roots and Fruits", the main attraction of the Goodwill Week was the international première of the Goodwill Song, composed and conducted by Virgil Vihaan Sequeira and performed by the Goodwill Choir and the Strings 2019 orchestra including the folk musicians of the Hills. The important highlights of the Week included an exhibition consisting works of Nicholas and Svetoslav Roerich — "Painters of Kanchenjunga". Another exhibition "Visions of Darjeeling — Darjeeling yesterday-today-tomorrow?" of architect Shasheesh Prasad urged people to take responsibility for a better, more beautiful and sustainable tomorrow. In the fields of art, education and sustainability interactive meetings and discussions were held. A special contribution regarding the participation of Darjeeling community in the Global Action Plan of UNESCO in the Sustainable Development Goals, Water and Sustainability was also discussed. Art classes, competitions along with story telling with art students were an important component. Darjeeling Goodwill Centre (DGC) celebrated a decade of his love and labour of cultural contribution, inspiration and creativity by observing the 'Xth Goodwill Week' from November 10 to November 15th.